On 24 July Foch had held a meeting with Pershing, Haig and Pétain to urge that they all abandon the defensive attitude adopted until then. The Americans were recently successful in cutting the main German supply road from Château-Thierry to Soissons and were now able, with French assistance, to recover the ground lost after the May-June-July offensive which had started on the Chemin des Dames. For the first time, Marshal Foch made mention to Pershing of the reduction of the St. Mihiel Salient, which would be assaulted in September. There are eighteen separate battles noted for August 1918 in France and Belgium, all in keeping with the previously agreed intent of keeping the German Armies constantly in action over a total distance of approximately 200 miles. The French and British carefully managed the boundaries and timing of each individual action, thus ensuring that the Germans continued to be kept off balance in this month. 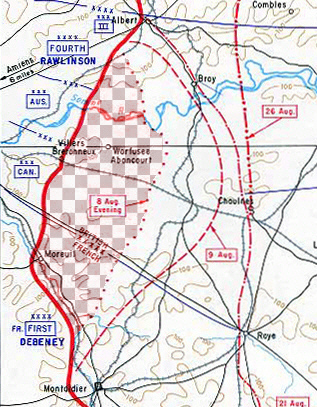 In the temporarily quiet Somme sector, Australian forces adopted a policy of unique and continuing trench raids, always designed to keep the Germans worried. In general terms, these operations were all "bite and hold" actions, the most famous being the Battle of Amiens, which started on 8 August. This battle was notable for the organization of all arms and the use of tanks in similar fashion to Cambrai in November 1917. The Royal Air Force even made parachute drops of small-arms ammunition, and carrier tanks were used to bring ammunition to the guns. These tactics became the model for fighting these last hundred days (and indeed of the war in Europe in 1944). This period is also notable for General Haig's Army Order, of which a part urges "the necessity for all ranks to act with the utmost boldness and resolution in order to get full advantage from the present favorable position. Risks which a month ago would have been criminal to incur, ought now to be incurred as a duty. It is no longer necessary to advance in regular lines step by step �.". Coincidentally, the Spanish influenza, which started taking a hold in the middle of June (at Camp Funston, Kansas), was roaring through England, France, Germany and the Americas, causing millions of deaths worldwide. General Foch was promoted Marshal of France on 6 August and remained Generalissimo, organizing the Allied armies until the end of the War. It is worthy of note that munitions workers in the UK chose these times to strike! This is a detailed and long-overdue examination of this most bloody battle, actually a six-week-long major campaign of World War One. There have been only two book-length studies of the Meuse-Argonne since 1985: Paul Braim's The Test of Battle (Univ. of Delaware, 1987) and Robert Ferrell's America's Deadliest Battle (Univ. of Kansas, 2007). Braim's work was long on detail and short on cogent analysis; Ferrell was long on analysis but short on tactical detail. Lengel's work is full of both, based as it is on a thorough study of primary and secondary sources including first-person accounts and unit histories. Attacking across broken, hilly ground held by deeply entrenched German forces since 1914, the American First and Second Armies took over 120,000 casualties, including 26,000 dead. Yet, this was a combined-arms battle involving both tanks and aircraft in both the scouting and attack modes. 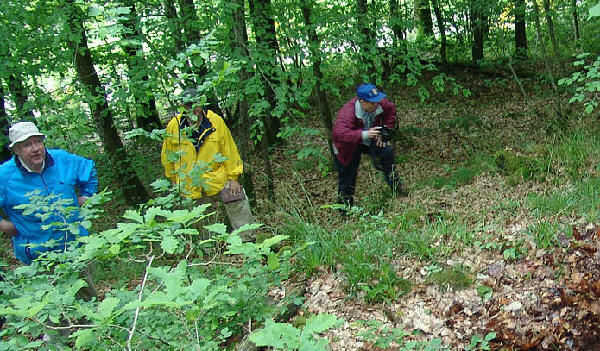 It was also a hard learning experience on a steep curve for inexperienced American infantry leaders and artillerists, who learned their trade in a series of costly frontal attacks. Logistics, despite the careful planning of George Marshall and other skilled operations officers, was also an issue. Massive traffic jams hampered the attack for days and led to French calls for AEF commander Pershing's removal. Indeed, problems of food and ammunition supply and evacuation of the wounded were not resolved until after a mid-campaign pause for rest and reorganization. In all, you will find here many accounts of the participation of future American military leaders (MacArthur, Marshall, Patton), as well as details of the individual actions, units engaged and analysis of results. These accounts will be familiar to specialists but new to general readers not familiar with the details of American participation in the Great War. And, here lies the value of this book: educating a new generation of readers. 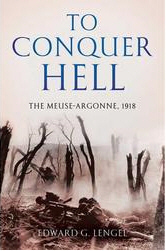 To Conquer Hell: The Meuse Argonne, 1918, Edward G. Lengel, Henry Holt, 2008, 491 + xiv pages, photos, maps, index, notes, bibliography, ISBN 0 8050 7931 9, $32.95 cloth. The author teaches at the University of Virginia and is scheduled to speak at the September 2008 Western Front Association annual national seminar at Carlisle, Pennsylvania. I made a new friend this past March and lost him by June. 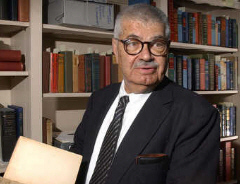 He was Professor Matthew Bruccoli of the University of South Carolina, the world's leading authority on F. Scott Fitzgerald and the other authors of the Lost Generation. It was his work on the First World War, however, that led me to call him at his office one day -- I wanted to interview him about the series of WWI literary classics that is being reissued by his university's press under his guidance and about his two vast collections of publications, memorabilia and art from the war. I suspected the key to his enthusiasm for studying the war was the fact that all his projects are dedicated to the memory of his father Joseph, a veteran of the AEF, but I wanted to confirm this and learn more about the professor's projects. After introductions and outlining my initial questions--the sources of his interest in the war, his father's military experience, the literary impact of the war--the professor, who I immediately read as being of the "gruff" personality type that does not suffer fools one iota, responded comprehensively. He held forth with passion, humor and enormous pride on all the topics I raised and on some I should have raised. He was both scathing and hilarious when I asked him how a patriot like himself got along in an academia now dominated by people hostile to American traditions and position in the world. Believe me, after hearing about his many battles in the halls of academe, it was clear to me that he taken on all comers in those struggles for forty years with glee and, I believe, with great success. The key--as I anticipated--to all of his effort to encourage study and scholarship on the war was really his father and what I learned about him was fascinating. 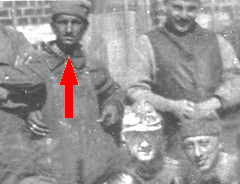 When Joseph Bruccoli was called to arms in 1917, he happened to bring along a unique skill. He could drive the difficult-to-learn Pierce-Arrow truck of the era, of the type that was being sold to the French Army. So he was detailed to a group of doughboys assigned to drive for the French forces, bringing supplies to the front line in every zone on the Western Front. This proved extremely hazardous for Joseph, who returned from the war wounded, shell-shocked and with eight campaign badges. Despite his rough period of service, though, he found the war had intensified his love and admiration for his country and especially those who served in her military. He passed these values on to his son Matthew, who was born at the height of the Depression. I found the respect and love that Matt expressed for his dad admirable and touching. Our further conversation involved a lot of discussion about the literature of the war, which I won't get into here. 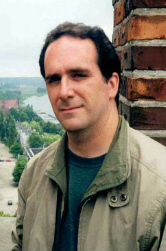 In the April Trip-Wire, we included a major article on the Joseph M. Bruccoli book series selected by Matt (link) and in our future issues, regular reviewer Len Shurtleff will be providing reviews of books from the series. At some point in our chat, however, some floodgate opened -- we realized we were dealing with kindred souls. He was excited to discover that I led tours to the battlefields and asked me to design and lead a tour for himself and a group of students next year. Then, we talked about my magazine OVER THE TOP, and he was particularly happy to hear we had published James M. Cain's "The Taking of Montfaucon", which he considers one of the best stories to come out of the First World War. Spontaneously, he offered a war story by Thomas Wolfe (Look Homeward, Angel, 1929) from his collection for publishing in my magazine. After two hours, or so, he had other matters to attend to, but we agreed to talk again when I returned from my spring trip to the Western Front. I looked forward to our future collaboration. Less than a week after our chat, I received a whole box of material from Matt, copies of all the books in the series published thus far, the Thomas Wolfe story and a list of places he wanted to visit with his students on the forthcoming trip to France. Recently I pulled a VHS tape off the shelf to check its contents and found that I recorded the 1919 silent version of The Lost Battalion when it was aired during the American Movie Classics Channel 6th Annual Film Preservation Festival in the summer of 1998. Directed by Burton King and produced by Edward MacManus (former head of Hearst's International Film Service), this version was restored by the Library of Congress and runs approximately 67 minutes. What makes this release so interesting is the fact that it was released in July 1919 (within 8 months of the Armistice) and featured some prominent members of the original "Lost Battalion" in the cast. It is generally considered one of the first "reconstructed documentaries." The opening title states, "For the first time in the history of the world, you are to look upon a motion picture re-enacted by those who live again the historic events for which a grateful nation commended them." Appearing as themselves are Major-General Robert Alexander, Lt. Col. Charles W. Whittlesey, Major George McMurtry, Captain William J. Cullen, Lt. Arthur F. McKeogh, Lt. Augustus Kaiser, Private Jack Hershkowitz, Corporal P. Cepaglia, Sergeant Herman J. Bergasse, Private J.J. Munson, Private J. W. Rosson and Private Abraham Krotoshinsky. Even Cher Ami, the heroic carrier pigeon, played himself. The inter-titles often refer to the 77th Division as a "melting pot." A term first popularized in 1908, with the play "The Melting Pot" by Israel Zangwill, about the immigrant experience in pre-war America. The recurring theme of democratic diversity would appear in numerous war films through out the decades. Among the fictional draftees in the division are two Chinese-Americans from feuding Chinatown tongs, a burglar who assumes another man's identity to escape the law (Sydney D'Albrook), the son (Gaston Glass) of a wealthy man in love with his father's stenographer, and "The Kicker" (Jack McLean), an office worker who finds fault with everything. Opening scenes include some exceptional aerial photography of Manhattan in 1919. The tallest building seen is the 57-story Woolworth Building, the tallest building in the world until 1930. The plot follows the men through training in Yaphank, Long Island and in Pas de Calais, France before entering the Meuse-Argonne Offensive. The original artwork by Augustus Kaiser is used to illustrate the inter-titles, and animated maps effectively portray the advancing offensive line and the eventual encirclement by the enemy. 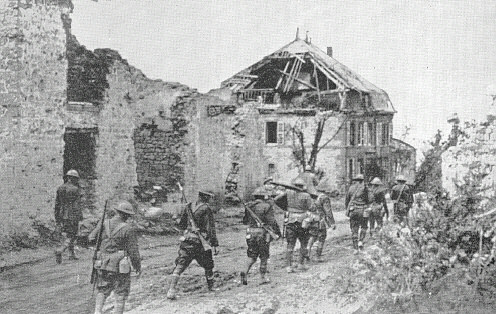 The location used for the battle sequence was selected by regimental engineers as conforming closely to the actual battlefield in the Argonne. The version restored by the Library of Congress is incomplete and adds some difficulty to following the epic battle and other scenes. Original Signal Corps footage is used to depict the training, some battle scenes, the welcoming triumphant parade in New York City and the cemetery where the dead of the battalion are buried. It was while trying to reach the battalion that professional baseball player Eddie Grant was killed. Look into our archives for more information on Eddie Grant: (link). with a part of the 77th division in No Man's Land during the recent Great War. French troops on one side and their own division on the other flank. And they were caught and surrounded in a "pocket." while they tried to signal airplanes. Ami," got through, losing an eye and a leg. And they sent out 37 couriers, each of whom failed to get through. But the 38th man made it-and help arrived-and again there was food and water. same men and officers who were in the actual turmoil in France. a photoplay superior to many entirely of fiction." Unfortunately, the 1919 version of The Lost Battalion has never been officially released on DVD. Copies do show up on the internet but I can't vouch for their quality. The 2001 film version of The Lost Battalion, directed by Russell Mulcahy and starring Rick Schroeder as Major Charles Whittlesey is readily available on DVD. Bison Books has recently republished The Lost Battalion by Thomas M. Johnson and Fletcher Pratt. Other films of interest that include actual participants as reenactors include: Theirs Is the Glory, 1946, was released about the World War II battle for the Arnhem Bridge during Operation Market-Garden. It was filmed on location in Arnhem, and it features the actual officers and men of the British paratroop force portraying themselves. In 1948 Sands of Iwo Jima was released with the actual surviving Mount Suribachi flag-raisers reenacting that event. The following are thanked for their contributions to this issue of the Trip-Wire: Len Shurtleff, Tony McIntosh, Bob Ford, Robin Clayton for Troy Leach's Wound Certificate, Christina Holstein, Tony Noyes, Andrew Melomet, Tony Langley and Kimball Worcester. Until next month, your editor, Mike Hanlon.